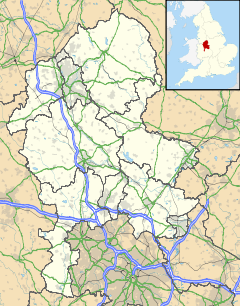 Shelton is an area of the city of Stoke-on-Trent in Staffordshire, England, between Hanley and Stoke-upon-Trent. The route of the Roman Road called the Rykeneld Street passed very close to Stoke-on-Trent railway station. Shelton had an artisan pottery industry which was documented as early as 1685, when one Thomas Miles was producing white stone ware. Shelton had the earliest gas works in the Potteries. The works were opened in Shelton's Lower Bedford Street, under the ownership of the British Gaslight Company, to supply Hanley and Stoke in 1825. The British Pottery Manufacturer's Federation Club is a large private member's club situated in Federation House, just opposite Stoke-on-Trent railway station, and is run for the benefit of the many local pottery manufacturers. It was established in 1951, and still operates. Shelton is the home of the main Staffordshire University campus and library, which specialises in art and design teaching. The presence of a major University has resulted in the residential area having a large student population during term-time. Shelton mostly consists of Victorian terraced houses and is occupied by a combination of owner occupiers, students, and private landlords. Families tend to cluster more around the western edges of Hanley Park and around the large cemetery that stretches north into Cliff Vale. These latter two protected green spaces, along with the route of the Cauldon Canal, serve as a natural buffer between Shelton and the south of Hanley (the "city centre"). The 2001 Census defined Shelton as "multicultural". The Staffordshire University main campus and main library are located a few yards from Stoke-on-Trent railway station, which is a mainline station with excellent connections to Birmingham and London. 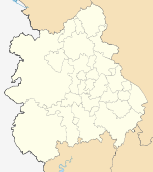 Stoke-on-Trent College is also located at the northern boundary of Shelton. In September 2011 the city's Sixth Form College also moved nearby, to a new building, as part of a masterplan to create a unified educational "University Quarter" for the city. The wider Shelton area is included within this area known as the University Quarter, and has subsequently seen continuing regeneration in recent years. Within the grounds of the University is the Film Theatre, a purpose-built cinema which during term-time shows art house films. There is also a large art supplies shop that serves the many art students and which is open to the public. The University Library can be joined by members of the public for a small annual fee. Each year in June the campus becomes a huge public art and design show, as the graduates show their final work. The large historic Victorian ornamental park called Hanley Park underwent a £2.8m improvement project which was completed in 2007. The Park often plays host to Council-funded pop music events and similar summer outdoors entertainment. ^ "Hanley West and Shelton, 2001 Census". Archived from the original on 6 January 2009. ^ "Shelton Blog". Archived from the original on 16 July 2013. Retrieved 2008-09-01. ^ "National Statistics Output Area Classification". Office for National Statistics. Retrieved 3 September 2008. ^ "University Quarter". Staffordshire University. Archived from the original on 19 October 2008. Retrieved 15 August 2008. ^ "Stoke Film Theatre". Stoke-on-Trent Film Theatre. Archived from the original on 21 November 2008. Retrieved 3 September 2008. This page was last edited on 19 September 2018, at 05:29 (UTC).